We created SEQUENTIAL to be a curated digital graphic novel and comics app for iPad featuring intelligent, entertaining, life-enhancing storytelling at its best – and to provide the best browse, buy and read experience for digital comics and graphic novels on the planet. Publishers on SEQUENTIAL include Dark Horse, IDW, Top Shelf, Fantagraphics, NBM, Knockabout, Blank Slate and Myriad, with more coming on board all the time. 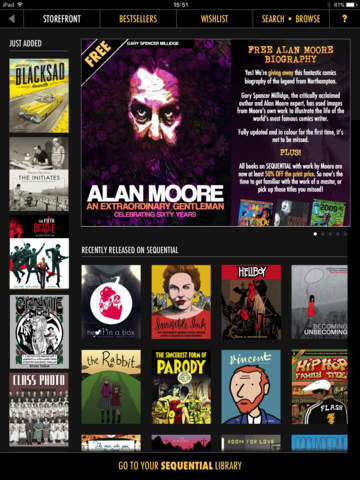 Creators include Alan Moore, Jamie Hernandez, Brian Bolland, Eddie Campbell, Gilbert Shelton, Neil Gaiman, Bryan Talbot, David Lloyd, Dash Shaw, Hunt Emerson, and the cream of the small press. We don't do superheroes. You can get them in lots of other places. If you like what we're trying to do, why not download SEQUENTIAL for your iPad here? SEQUENTIAL is a service of IMPERATIVE, headquartered in Tokyo with a branch office in London.